With the shipment of ARIS SR 2010_05 also the integration with webMethods 8.0 (SP1 with Fix pack 2) was officially released. There were already some questions in the community about the scope of the integration or the next steps. In this article I want to give you some insights and show how the integration approach works in detail. The first integrated use case we support is “Process automation”. That means customers can use their business processes as direct input for the IT department so that the IT guys can implement these processes. The business analyst can define business processes in form of EPC process models. He can browse the repository for appropriate business services supporting the process or organizational elements (roles, person types, organization units, etc) carrying out certain process steps. Further it is possible to define KPIs (which were set up in the strategy phase of the project) to measure functions in the process. After the business analyst finished his work, the process can be transformed to a logical process (this process is more concrete, but does not deal with any technical stuff). This step is fully automated by a transformation from EPC to BPMN 2, which is based on the ARIS transformation framework. As the details about this transformation would go beyond the scope of this article, I would like to dicsuss this topic in another post. The transformation considers the complete control flow, services, KPIs and organizational elements, which were defined in the business process. Afterwards the BPMN 2 process can be reworked by a role we call process engineer. His job is to add information about software services which are realizations of the business services used in the business process. Additionally he can define further steps which are not business relevant, but are a meaningful input for the later implementation. The BPMN 2 process can now be exported to webMethods BPMS. Currently the data exchange between ARIS and webMethods BPMS is based on XPDL 2 due to the fact that the BPMN 2 serialization format is still under development. So let’s have a look at a small example which is also available as a step by step example shipped with ARIS (see ARIS help „Work with objects and models/Create service-oriented models/Example – SOA implementation with ARIS SOA Architect and webMethods designer”). The business analyst starts and designs a process for booking an invoice. In order to book the invoice it is necessary that the debitor already exists. In case the debitor does not exist a new one should be created. In order to keep track of the number of newly created debitors the analyst defines a KPI and associates it with the process step. In case the invoice amount is greater than 100 000 € the financial accounting must approve the invoice. Last the invoice is booked. This step is supported by the business service “Invoice management”. The business analyst transforms the process to BPMN so that the process engineer can perform the steps necessary to share the blueprint with the IT. As you can see the transformation automatically creates lanes based on the services and organizations participating in the process. Further we can easily distinguish between service tasks and user tasks by just having a look at the symbols being used. The KPIs are also attached to the steps in BPMN in an allocation diagram as BPMN 2 does not cover any constructs for defining KPI information. The developer can import the XPDL file into webMethods Designer. The import automically detects referenced services and imports them into thewebMethods Integration Platform. Also participants that are carrying out process steps are imported into the designer as well as the information about KPIs as shown in the screenshot below. I know that the future roadmap is also a hot topic for a lot of people visiting ARIS Community. As soon as we have defined it completely, we will give you an overview of what is coming with the next releases. Sorry, but where is function "check invoice amount" between two Xor operators? Of yourse you are right. I've just corrected the diagrams. This was really good example for an end-to-end SOA level implementation of Stratergy or goals of business. Can i able to do a prototype on the same , the only issue is how to get webmethos into this prototype since webmethods is not an free software but Aris express is an free software - Any help on my query. New is a well forgotten old. Back in 2005 ARIS already had such an option to export EPC to BPM via XPDL. Funny, it was done for SAG to be used in Crossvission, so history repeats. Technically it was possible but practically useless. 2) Analyst use EPC not in a way to be converted to BPMN one to one. Important details are missing, which means that EPC has to be redrawn anyway? So export is not critical. 1) Change ARIS methodology. The way analyst discovers and model processes should be similar to what BPM specialist do. I think it is a major issue. Hi...this is really a question rather than a comment. Exporting an EPC as an XPDL in order to orchestrate it in WebMethods - can this only be done through ARIS SOA Architect?? Or can it also be done through ARIS Business Architect? Does models issued from other perspectives/point of view in aris (eg.data, organisation ) can be exported in webmethod ? As Mr Lauer in his post said : "The KPIs are also attached to the steps in BPMN in an allocation diagram as BPMN 2 does not cover any constructs for defining KPI information". Does this happen in ARIS so we have to use BPMN allocation diagrams for KPIs instead, or this happens (generaly) in any other BPM or BPMS tools useing BPMN 2? this applies to BPMN modelled in ARIS. Other tools often don't support modelling of KPIs along with BPMN, because they mostly focus on process automation. Is it possible to migrate existing webmethods process models to ARIS like we create UML by reverse engineering Java code. yes, in principle it is possible. 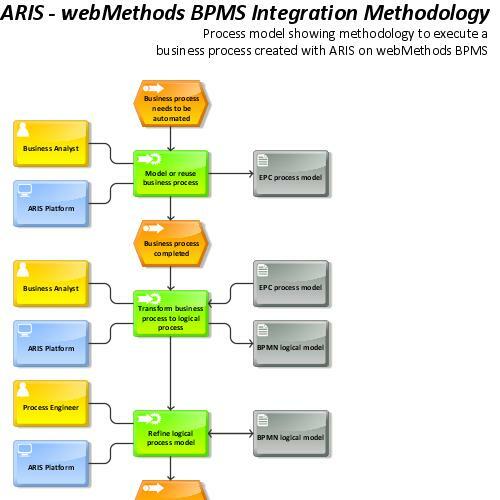 webMethods uses XPDL as storage format and ARIS can import it as BPMN 2 models. I suggest to get in contact with our field organisation so that they can show you how to do it in your specific setting. I have same question that Suzanne has asked. Can we export an EPC as a XPDL using ARIS Business Architect? or only Aris SOA Architect supports this? I want to create UML class diagrams in ARIS and generate Java code from it. Basically I am interested to know how to go about doing forward engineering in ARIS. i.e. generate java code from the UML diagrams which are created in ARIS. Could you please suggest where I can find ARIS transformation framework..
Kindly explian how to import an XPDL file to wM designer..
We're planning to go to "Process automation". What if business processes are defined using BPMN 2.0 instead of EPC? Which transformation to consider between business process and logical process ? Is it Governance still possible ? side note: you picked such an old thread to post to, I suggest you start a new post, because your interesting topic is easier to find. If both business and logical processes are in BPMN notation I suggest you start off with a variant copy of your business process BPMN model and enrich it with the details of the logical model, e.g. changing the task symbols to user task, service task etc. Then continue with the normal M2E procedure, sharing with IT etc. Advantage and disadvantage at the same time: You reuse the task objects. Advantage, because the relationship to the business process is immediate. Disadvantage, because at definition level you probably get ambiguous connections between tasks, when on logical level you insert tasks or merge several into one. Any other comments, ideas, opinions? my problem is that my right-click doesnt show any "webmethods" entry that i could use. since SR 2010_05 this should be available, no? When you can't see that menu item I'd guess you are missing the proper license. In the license key of your ARIS Business Architect you should see "wm". If not, you are missing that license.